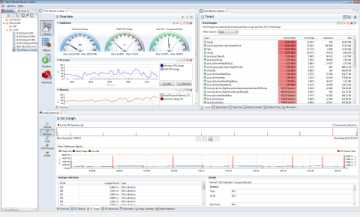 Oracle® JRockit Mission Control for Eclipse is a set of plug-ins for the Eclipse IDE designed to help develop, profile and diagnose applications running on the Oracle® JRockit JVM. JRockit Mission Control includes tools to monitor, manage, profile, and eliminate memory leaks in your Java application without introducing the performance overhead normally associated with tools of this type. JRockit Mission Control's low performance overhead is a result of using data collected as part of JRockit's normal adaptive dynamic optimization. JRockit Mission Control functionality is always available on-demand, and the small performance overhead is only in effect while the tools are running. These properties make the JRockit Mission Control tools uniquely positioned to be used on systems running in production. Version 4.1.0 is now available. It is a new release which supports JRockit version R28. Look at the Release Notes for further information. Supports JRockit JVM R28.x, JDK levels 5.0 and 6.0. Supports a subset of features for HotSpot JVM, JDK levels 6.0 and 7.0. Utilizes JRockit internal systems to do profiling with a minimum of overhead. Integrates with the Eclipse IDE offering jump-to-source code from classes and methods. Note that you need to run your Eclipse on a JDK installation (JRockit or HotSpot) for all features to work. For more information on this, please see the Run Eclipse on JRockit HOWTO. Version 4.1.0 is now available. It contains several new features and a number of bug fixes. JRockit Mission Control is available free of charge for development. For more information, see the Oracle® JRockit Mission Control home page. 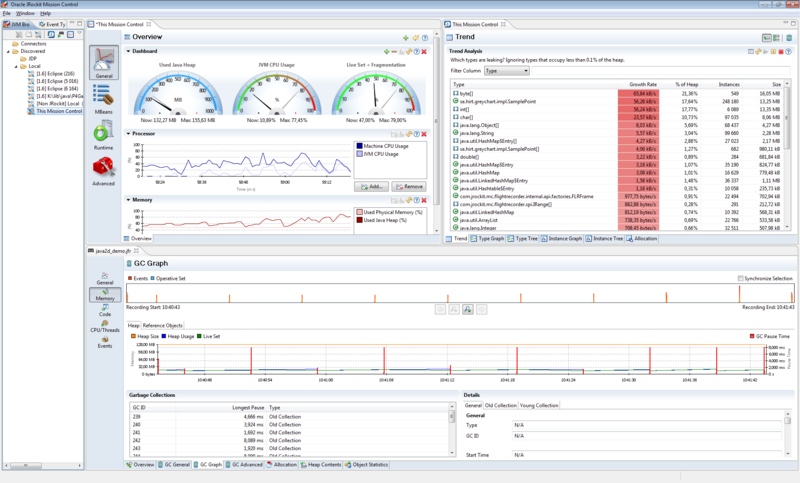 Oracle® JRockit Mission Control is a set of plug-ins for Eclipse 3.7. A newsgroup is available for posting questions about using JRockit Mission Control. Copyright © 1999, 2011, Oracle and/or its affiliates. All rights reserved.